Here's your guide to holidays at Disney World resorts, and the highlights from some of our favorites! If you like life-size gingerbread displays, then the Boardwalk, Beach Club, Grand Floridian and Contemporary should be your favorite stops! Come to the Contemporary Resort to see the giant Mickey wreath hung on the glass in the atrium, and be sure to check out the real gingerbread tree. DisneyContemporary.com has a Contemporary Resort Christmas photo tour. See more photos of the gingerbread tree here. The Grand Floridian Resort's gingerbread display might be the most impressive of them all -- a life-sized gingerbread house! Be sure to stop by and buy some gingerbread treats, which cast members sell right out of the house! The Boardwalk has a gingerbread display featuring Donald and Daisy that's not to be missed. And across the lake, the Beach Club boasts a life-sized gingerbread carousel! A photo tour of the Boardwalk and Beach Club gingerbread displays can be found here. After visiting the Beach Club, be sure to walk on over to sister resort Yacht Club to see its very special toy train display. Exotic and unique, the Christmas decorations at Jambo House at Animal Kingdom Lodge are not to be missed. AKLResort.com shows us some Animal Kingdom Lodge Christmas photos. Many have said that Wilderness Lodge is their favorite resort for Christmas decorations because of the cozy Pacific Northwest feel. Be sure to seek out the family of bears residing next to Silver Springs! 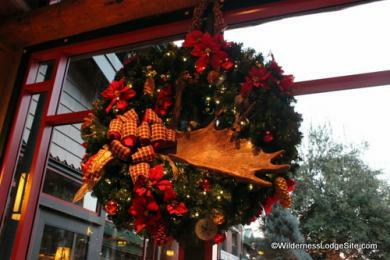 See Wilderness Lodge Christmas photos here. Colorful, bright and fun, Caribbean Beach Resort's Christmas decorations have an island feel -- plus, they showcase lots of cute ocean creatures. This is definitely something a little different! Be sure to check out both the Custom House and Old Port Royale. DisneyCaribbeanBeach.com shows us Disney Caribbean Beach Resort Christmas photos here. What's your favorite resort to hang out in and take in the holiday atmosphere? I think the Grand Floridian was the winner for us. When we were there, it was fascinating to see the giant gingerbread house and all the people getting pictures taken with the giant tree. We were a little disappointed at the Contemporary interior. The outside wreath was great, but we never saw the Gingerbread tree. Either we totally missed it, or it wasn't there - we saw something more like a small shed. I would have loved to have gotten one of those limited edition pins! Grrr!